Physically it involves the use of resistance…barbells, dumbbells, and machines as well as other equipment to improve strength and overall body systems…keeping the body vital and healthy. 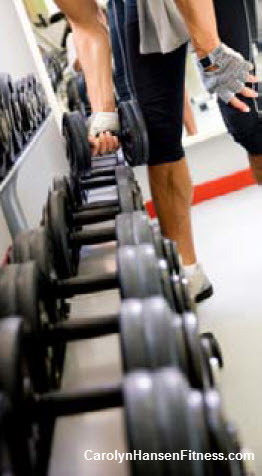 Strength training or resistance training strengthens your bones as it builds your muscles. It tones you and defines you as well as giving you cardiovascular benefits. It wards off diseases and chronic conditions and strengthens abdominal and back muscles that in turn reduces stress on the spine. This anti-aging force simulates the body to produce and release growth hormone…this hormone has been shown to renew old worn out cells and tissue and reverses the aging process. Muscles are important because muscle cells burn glucose (blood sugar) for energy and are the driving force behind your metabolism. Muscles are the very reason you can perform the physical tasks you do daily…strong muscles can make your daily task easier while weakened muscles make everything harder. Let’s face it, strong muscles are mandatory if you want to stay active throughout your life. Even rising from a chair becomes a challenge to those who do not pay attention to the needs of their muscles now as they eventually shrivel up and weaken and can no longer support body correctly. Osteoporosis does not have to be your destiny if you pay attention now. Strength training builds bone density which in turn reduce the risk for falls from weakened bones and muscles. Outer physical appearance and positive traits are not all that one benefits from regular strength training. Regular strength training (combined with some cardiovascular heart/lung exercises) also improves a person’s mental and emotional health and wellbeing as well. You literally become a new person inside and out with regular resistance training. Your self-confidence and self-esteem soar and depression departs. And, the benefits don’t stop there…you’ll sleep sounder too giving your body a chance to rejuvenate properly as well as giving your mind a time to rest and reboot. Strength training seems to be that magic formula that kicks the body into high gear and gets all systems involved and working the way nature intended. It is safe…for all ages and even for those who are presently fighting off an illness or disease. In fact, if you are battling illness, it is the very thing you need to be doing to strengthen both your inner and outer strength. It’s your key to preventing and reversing muscle atrophy and its negative consequences. Strength training is a major key to anyone’s anti-aging strategy no matter what age they start or what physical condition (of course you check with your Dr.) and since they only require two 20 minute sessions weekly they are not time consuming and everyone has time to perform.